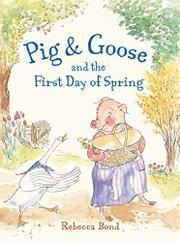 An unlikely friendship between a portly pig and a graceful goose blooms in a springtime story infused with compassion and gentle humor. When Pig observes Goose’s grace in flight, she asks the fowl to teach her. Pig’s attempts at flying are laugh-out-loud funny, but it's a shared laugh, not at either character's expense. Despite their considerable differences, the two charmingly anthropomorphic animals become friends. “Goody gumdrops!” sums up Pig's perennially positive attitude, so her disappointment when she cannot learn to fly like Goose is palpable. Her amazement at Goose's ability to swim is equally believable, causing her to rue that she is not “elegant,” “graceful,” or “quiet,” like Goose. Goose graciously points out that Pig is “other things.” Goose is gratifyingly appreciative of Pig's delicious cooking, her skills as a hostess and raconteur, and her infectious enthusiasm for picnics and parties. Bond breaks the fairly extensive text into three chapters, making the story feel approachable while giving new readers a sense of accomplishment. Simple, repetitive vocabulary and no more than eight lines of text per page help make the story accessible. With 48 pages and an on-the-large-side 7-by-9-inch trim size, the book leaves plenty of space for Bond's expressive watercolor illustrations on every page.